The following is the review of Burnham fund. This stock fund is recognized as the top rated U.S. stock fund by Morningstar and Lipper Rating. It invests in large companies’ stocks or blue chip companies. More details can be found below. 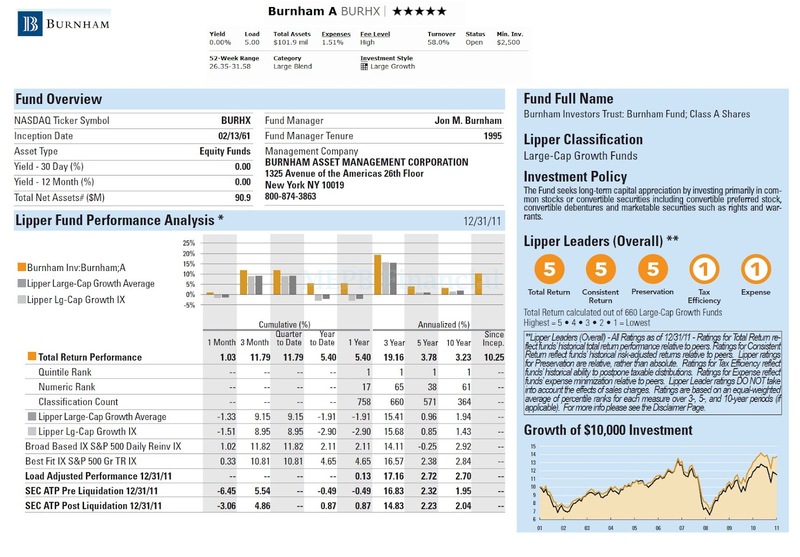 This Burnham fund invests in a diverse portfolio primarily consisting of common stocks. It invests in large-capitalization stocks (Market cap >$11 billion). These companies are known as blue chip companies and are usually well-established companies. Under typical market conditions, the fund intends to remain fully invested with only minimal investments in cash or short- term debt instruments. Since 1995, Jon M. Burnham is the lead fund’s manager. This Burnham fund has an expense ratio of 1.51% per year. It also has a front end sales load of 5.00% and a 12b1 fee of 0.25%. The total net assets are $101 Million. It currently has no yield (i.e. yield is 0%). The turnover rate of the portfolio is 58%. This US domestic stock fund is rated with 5 stars rating by Morningstar. For 2011, this best US equity fund has returned 0.13%. Based on load adjusted returns, this fund has return 17.14% over the past three year, and 2.72% over the past five year. The best 1 year total return of this top fund was achieved in 1999 with 32.65%. You can buy this U.S. stock fund from 73 brokerages like TD Ameritrade, Inc, RBC Wealth Management, JPMorgan, Federated TrustConnect NTF, H&R Block Financial Advisors Inc, etc. You will need $2,500 initial investment for your brokerage account and $100 for your tax deferred account or IRA. The other classes of this fund are class C (ticker: BURJX), and Class A with Load waived (BURHX.LW). As of January 2012, the top 5 sectors of this top stock fund are: Energy, Consumer Cyclical, Technology, Industrials, and Financial Services. The top 10 holdings are: Apple, Inc, Chipotle Mexican Grill Inc A, Williams Companies Inc, Kinder Morgan Management LLC, McDonald's Corporation, SPDR Gold Trust, American Express Company, Caterpillar Inc, Metlife Inc, and Ford Motor Co.